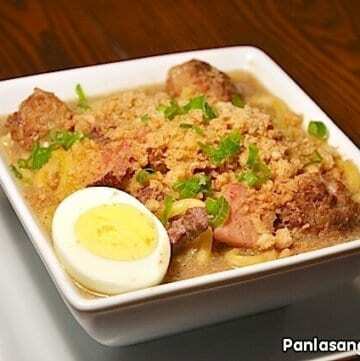 Lomi or Pancit Lomi is a type of noodle soup dish that makes use of thick egg noodles. Although this dish originated from the Chinese, several different regional variations became available throughout the years. The most popular among these variations would probably be the Batangas Lomi. I always eat Lomi when I’m in Batangas and the best that I had so far was in Lipa City in a place called “3kids”. You might be wondering what is in Batangas Lomi that makes this variation stand out. First, let me tell you what’s not in it – vegetables. If there would be vegetables, it would just be onions and onion leeks or scallions (but these are not always present). As for the texture, the soup is very thick and somewhat slimy – in a good way. The bowl of soup is also like a meat stand because it is filled with different meat ingredients like pork or chicken, kikiam, ham, and meatballs, to name a few. I also remember having a generous serving of crushed chicharon on top. This recipe that we have here is not the exact Batangas Lomi, but rather a hybrid. I mixed my own version with some of the good qualities that I like most in Batangas Lomi. Enjoy! Add-in the ham and liver then cook for 2 minutes. Put-in the cooked meatballs and kikiam then simmer for 3 minutes. Add-in the ground black pepper and miki noodles then cook for 5 to 6 minutes. Francis -- Vanjo (the site owner) is based in the US which uses English system hence the use of lbs vs kg, etc. Thank you Panlasangpinoy for sharing ideas to all peoples does’ nt know how to cook Lomi like me, the Lord will bless you.